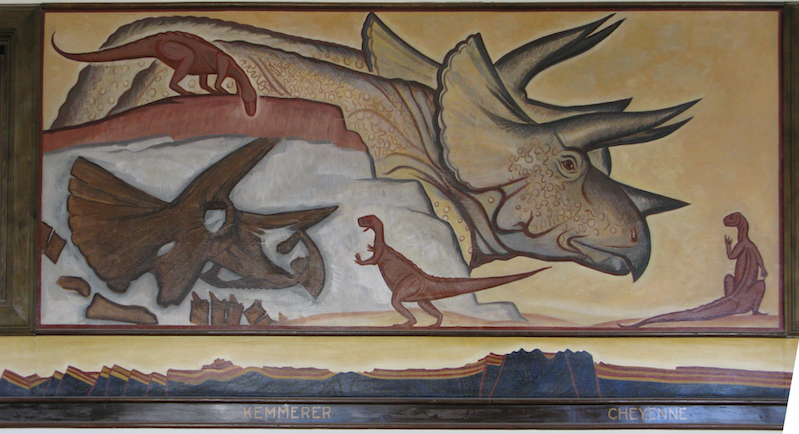 Eugene Kingman painted three murals of the Post Office in Kemmerer, Wyoming. These murals depict archeological excavations in this area of Wyoming. Mastodon bones excavated from the Kemmerer fossil beds, along with an imagined reconstruction of the mastodon and other prehistoric animals. Below these images is a strip showing the landscape around Kemmerer. This mural is positioned above the service windows and to the left. Below the mural you can see the names of stops along the railroad that reaches Kemmerer.